Long before things started going south for the party of Lincoln, Connecticut's fourth congressional district had been singled out as a tough one to keep in the family. 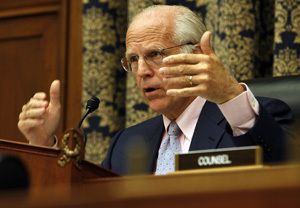 Ten-term Republican incumbent Christopher Shays, though considered a moderate, barely fended off a 2004 challenge from Westport selectwoman Diane Farrell. This year, Farrell has mounted an even heartier campaign, tying Shays to the Iraq War, which he supported  though he did call for Donald Rumsfeld's resignation last week. Farrell is up 46-41, but it's still a close enough race to call on the party's prime-time faces. So last week, Democratic inspiration Teddy Kennedy appeared at Farrell's side. Keep in mind that Farrell (like many Democrats) wants House speaker Dennis Hastert to resign and wants Shays to return any funds raised by the tainted Foley. A tired, irritable Shays fought back with this: "I know the speaker didn't go over a bridge and leave a young person in the water, and then have a press conference the next day." Can we get a "Oh, no, you didn't!" from the gallery? Perhaps a "You did not just go there"? Shays was, of course, referring to Chappaquiddick, the 1969 incident in which Kennedy's car ran off a Massachusetts bridge, killing his passenger, Mary Jo Kopechne, and burying Kennedy's chances of reviving his family's presidential legacy. When you think about it that way, Shays is right. Dennis Hastert and Ted Kennedy have absolutely nothing in common.